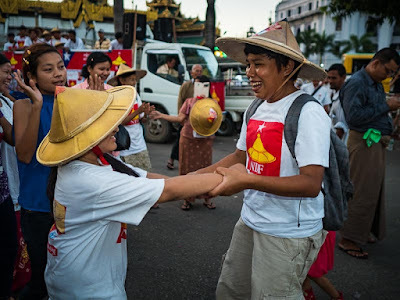 NDF supporters dance at the end of their rally Friday evening. 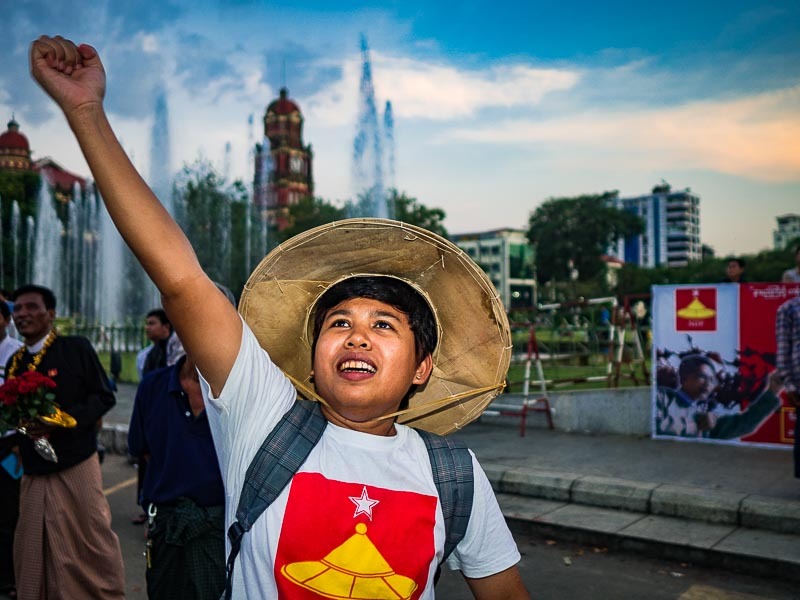 Myanmar's campaign season is over. Friday was the last day politicians and parties could legally campaign. Saturday is a quiet day so voters can consider their choices. I've been to five rallies, minor parties and major parties, and the only rallies with any sense of excitement or serious motivation were the NLD rallies. At the other rallies people sat stone faced and listened to candidates make speeches with polite applause. 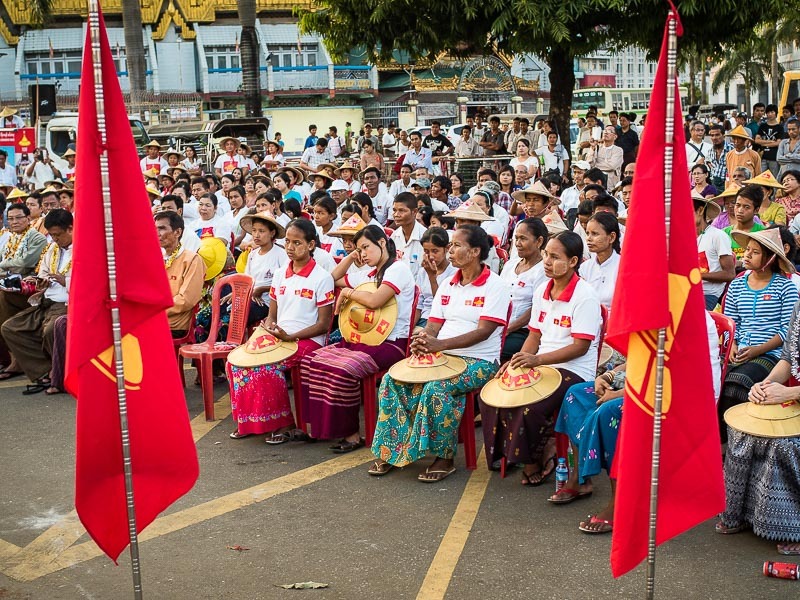 People listen to NDF candidates speak during their final rally. The NDF, National Democratic Force, was formed in 2010 by people disaffected by the NLD's decision to boycott the 2010 elections in Myanmar. A part of this is that the entire notion of campaigning here is brand new. For more than 40 years, any large gathering of people was met by a police/military presence. Any discussion of politics meant going to jail. 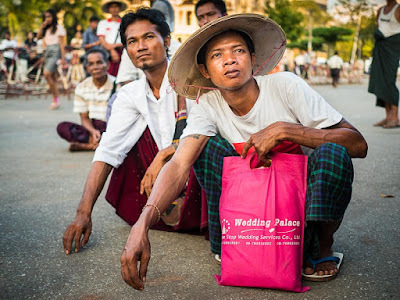 You couldn't even say "Aung San Suu Kyi." Saying her name meant going to jail. So on a certain level I understand why the election campaigns here have been low key affairs. I went to the NDF rally Friday evening. 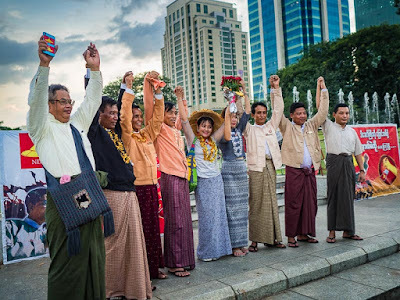 They're a small party (fewer than 10 seats in the national parliament) but I've seen their canvassers all over Yangon this week so I thought their rally would be an interesting one. People listen to speakers at the NDF rally. People would sit for hours to listen to the candidates. There were a couple of hundred people at the rally. Most wore white tee shirts with the NDF logo emblazoned on the front. Many wore conical peasants' hats, also emblazoned with the NDF logo. People listened to the speakers, applauding politely when there was a pause in the speech. The speakers did not use teleprompters or notes - they either memorized their speeches or spoke off the cuff. (I've noticed the same thing in Thailand). I find that refreshing, coming from a background where every speech is presented via teleprompter or from notes. When the rally ended there was some brief celebration before people got into trucks and busses and went on their way home. NDF candidates in their victory pose with some of Yangon's new buildings behind them. Enthusiasm at the end of the rally. We don't know what's going to happen Sunday. 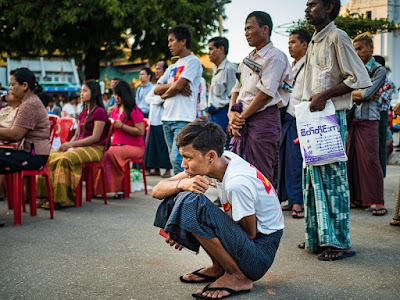 I've heard speculation on BBC that turnout may not be as high as expected because Burmese aren't fully trustful of the system. Others have speculated that lines will be hours long and we'll see voter turnout like the world saw in South Africa in 1994. We've heard that results will be out Monday and we've heard that it will be weeks before results are known. Both of the major parties have poll watchers who presumably will track results at polling stations, so we should have some unofficial sense of how things are going by Sunday night. There are more photos from the NDF rally in my archive or available from ZUMA Press.